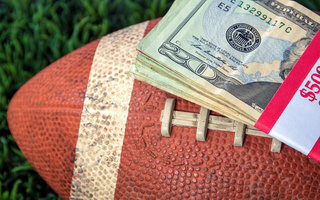 The second week of April is a busy time on the sports betting calendar. March Madness concluded with the NCAA Championship game on Monday, Major League Baseball is in full swing, the NHL playoffs get underway, and NBA’s regular season ends with the playoffs just around the corner. The sports headliner of the back end of this sports-filled week is the 2019 Masters Tournament, which begins Thursday in Augusta, GA. It marks another milestone sporting event for the New Jersey sports betting marketplace to “grip it and rip it” in their betting apps. So it’s a great idea to keep your smartphone fully juiced for in-advance wagering, in-play betting, and daily head-to-head matchups using one of 13 NJ sportsbook apps. The “tradition like no other” of the Masters also means there will be limited on-air TV coverage of morning and early round play, so you may need to charge up multiple devices to view the action. Because of its marquee sporting event status, NJ online sportsbooks will be offering specific betting propositions for The Masters. As a refresher, prop bets are relevant to outcomes within a round or throughout the entire tournament. Prop bets can be on an individual golfer’s performance, e.g., will Rory McIlroy finish in the Top 5 or Top 10, or total tournament performance, or the number of holes-in-one. The NJ sportsbook then sets the line for each prop occurrence, usually charging extra “juice” on props versus spreads/moneylines, making it easier for them to profit on these types of wagers. For those who will be following the action from New Jersey, make yourself an egg salad or pimento cheese sandwich to get into full Augusta mode and read our review of what each of the NJ sports betting apps is offering for the Masters as of Tuesday. We’ve given each of the books a golf-themed score based on the depth, variety, and creativity of their offerings. Resorts Sportsbook has 40+ individual head-to-head tourney matchups posted. These are for the full tournament and include multiple matchups featuring the big names of Dustin Johnson, Tiger Woods, Jordan Spieth, and McIlroy. Drawing on the international flavor of the Masters’ field, Resorts has props based on the top finisher in each of 10+ nationalities plus Top 5 and Top 10 finishes, and making or missing cut. Hard Rock offers a good assortment of Top 5, Top 10, and golfer nationality props, but only 14 head-to-head betting options. The latest entry into the New Jersey sports betting landscape is Golden Nugget Sports, which launched in February 2019. As SBTech also drives Golden Nugget, you can expect the similar prop offerings and odds as Resorts and BetAmerica platforms. Sportsbook 888 sportsbook offers what I refer to as the base selection of winners and Top 5 and 10 finishes, and the nationalities of the winners. If you like a few golfers, but you can’t decide which one to win, 888 offers odds on the exact first- and second-place finishers (a straight forecast). It is a nice effort by the 888 team — no “snowmen” on its Masters’ betting props scorecard. It also offers 30+ head-to-head matchups, and some make/miss the cut on a few selected players. However, as we have seen in its NJ app offerings for other major sporting events, “America’s No. 1 Sportsbook” three-puts this green. There is just not enough on offer, and I always feel like there should be much more to choose from a market leader such as William Hill. Also, BetStars does highlight that its outright winner odds will payout at ¼ of the prices for a first-five-placing finish. A very nice offering by BetStars; golf claps all around. Unfortunately, the Caesars‘ Masters props offering finds the deep rough after an errant tee shot. Perhaps the props will be increased/enhanced between now and the tournament start on Thursday morning. The pricing is listed in alphabetical order by the players’ first name. This is maddening, especially if you didn’t know that Mr. Dechambeau’s first name is Bryson. DraftKings app indeed has the Masters’ prop market covered. To use an analogy, if the maximum number of clubs one can carry in a bag is 14, the DraftKings’ loop is the same size as the Al Czervik bag from Caddyshack, as its cup does runneth-over with all kinds of offerings, all within a well-organized, user-friendly format. The DraftKings’ app has put itself in a great position to win a green jacket later in the weekend. The SugarHouse Sportsbook app is “straight and strong” off the first tee with a well-balanced array of Masters’ betting props for its NJ players. In addition to the offerings for the winner of the tournament, SugarHouse also offers a prop on the best 18-hole score of the tourney, which isn’t necessarily the winner. PlayMGM Sports offers a solid Masters’ prop menu. While it’s much lighter than others on “Home Country of the Winner” offerings, it does have a full menu of head-to-head matchup offerings. PointsBet NJ sportsbook does an excellent job of covering all of the Masters’ app offerings, while also putting some props in play that no one else has on the board. Also, FanDuel offers prices for final finishing positions down to the Top 30 and Top 40 finishing positions. While FanDuel covers the bases with props on the top performer in each region and outright winners, there were no prop offerings listed for head-to-head matchups at the time of this writing. So, maybe a mulligan is needed to add head-to-head matchups to the Masters’ betting menu. Now that you’ve seen all of the props, go ahead and make some bets, have some fun and hopefully cash some nice tickets. Of course, if you aren’t able to get the tournament prop bets in by the 7 a.m. Masters’ tee-off, there will be plenty of in-play and round-by-round options every day up until the 72nd and final hole on Sunday. Mike's consultancy advises clients in such areas as media buying, sponsorship analyses, and procurement best practices. Additionally, as a New Jersey-based sports fan and handicapper, he provides a unique perspective from business operations all the way to the betting windows.